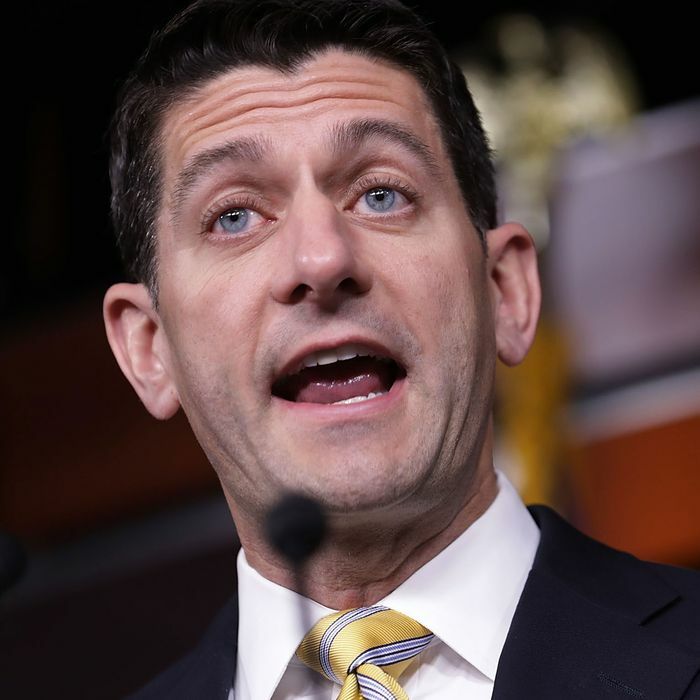 Paul Ryan Says Employer Coverage Is Safe From His Health-Care Plan. It Isn’t. The problem, he believes, begins with people mistakenly thinking the bill affects job-based insurance. “They just see ‘healthcare’ and they think their own healthcare may be at stake,” he says. Only 11 percent of people buy insurance as individuals, he explains, but that market is collapsing because of Obamacare’s costly mandates. If people who have employer-based insurance only knew that Republicans were only taking insurance away from other people, not them, they would like the GOP plan! In fact, Ryan’s description is wrong. As Stephanie Armour and Michelle Hackman reported in The Wall Street Journal earlier this month, the GOP health-care plan would actually jeopardize existing coverage for people who get insurance through their employer, not just the ones who get it from Medicaid and the individual market. The Republican plan would give states a waiver from Obamacare’s insurance regulations, which require that plans cover essential benefits and prevent them from putting lifetime caps on a person’s costs. And employers who shop for insurance can select a plan from any state. That means if even a single state takes the waivers, then every employer buying insurance could purchase plans that subject their employees to the kinds of price discrimination that Republicans want to impose on the individual market. People with preexisting conditions, or family members who have one, could suddenly find the workplace insurance they thought was totally safe now exposed them to massive new costs and the risk of medical bankruptcy. The larger point is that people like employer-based coverage because it’s the exact opposite of the kind of market Republicans want to create. There’s no medical underwriting. Healthy people and sick people pay the same amount for their coverage. Ryan is promising that they won’t be exposed to the every-man-for-himself principles that guide Republican policy on the individual market. What’s telling is not only that he’s lying. That he feels the need to lie in the first place shows just how unpopular he understands his own policies are.